Jim Nutt made a rare appearance yesterday at the preview of his much anticipated show at the Museum of Contemporary Art, Coming into Character, which officially opens today. Though the Chicago artist does not currently reside in our city, his involvement in the off-beat Hairy Who group and the Imagism movement that can be seen as a quintessential milestone in Chicago art history, makes him a local treasure. Coming into Character is an extensive collection that exemplifies his work's ability to be simultaneously stunning and grotesque. 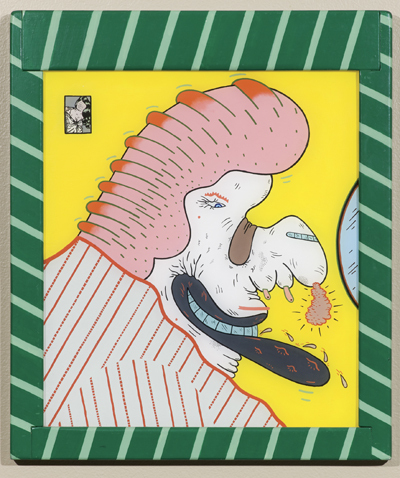 His acrylics on plexiglass are startlingly colorful and the extensive details of the often vulgar subjects pull the viewer in with a bizarre intensity. Severed limbs, skewed facial features, and unforgiving interpretations of genitalia may confuse some and offend others, but Nutt's ability to capture the senses cannot be denied. Many of Nutt's pieces in Coming into Character are accompanied by the drawings that he experimented with before jumping into the final project. The ghosts of erased lines provide a fascinating glimpse into the experimental nature of Nutt's process. Jim Nutt's Coming into Character runs through May 29 at the MCA.